The Timing Plate connects directly to a DIN socket at the back of TSA or ALBA. The Timing Plate is intended to replace the trap door in the 'g' by free fall experiment. When the ball bearing hits the Timing Plate a pulse is produced which is detected by TSA or ALBA. The size of the Timing Plate is 20x20 cm and consequently it is difficult to miss it with a ball bearing. 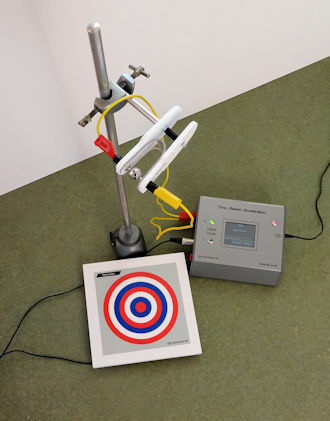 The Timing Plate can be used very effectively with the Energy Track to study projectile motion. It enables pupils to study launch velocities, time of flight, theoretical range, actual range , energy conversions.. The 'g' by freefall experiment using TSA, the Timing plate and the Release Mechanism. Note that no electromagnet is required.